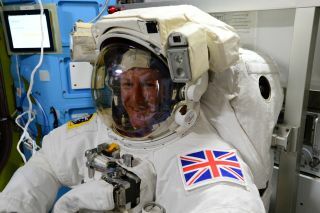 British astronaut Tim Peake was the first to wear the union flag on a spacewalk when he ventured outside the space station in January 2015. Space.com: What questions did you most enjoy answering for "Ask an Astronaut"? Peake: The chapter that I enjoyed writing the most was the spacewalk chapter. For me, the spacewalk was such an exhilarating and exciting experience, and quite an amazing thing to be outside the space station, to be working out in the vacuum of space for so long. So I thoroughly enjoyed writing and asking all of those questions. And I love trying to explain to people, as well, what it's like to be there, the view of Planet Earth looking down from outside the space station. The whole spacewalking chapter was by far the best. Space.com: What was the most surprising aspect of taking a spacewalk? Space.com: What's the hardest thing to describe about space? Peake: The hardest thing to describe is the feeling of looking back on Planet Earth. It's very difficult to put into words what it's like being in space. It's a mixture of the physical feeling of being weightless and being detached, and … the emotional feeling of what you're observing, as well, of Planet Earth. And when you put those two things together, it's really quite an overwhelming sensation. If you imagine being outside of the space station, inside a spacesuit, you don't feel any part of that space on you. There's no pressure, there's no gravity, there's no weight on your body. When you're completely relaxed, and just floating, you feel so remarkably detached because there's almost no force on your body. And then at the same time, you're looking down on Planet Earth passing beneath you, and then you turn the other way and you're looking up at the solar system and the universe and the vast expanse. And you put those two things together, the physical feeling and the emotional, and it's just a really overwhelming sensation. It's a complete change of perspective. And that's very hard to describe to people, exactly what that feels like. Space.com: You also tried to convey that feeling in your photo book, out earlier this year. Can you talk about how writing this book was different? Peake: With the photobook, that became a real driving passion of mine and a hobby whilst I was up in space. And also, during the mission as well, I was amazed at the response I was getting on social media when I was posting these photos. I felt I had a responsibility to try and share the mission as much as possible; to share the views that I was seeing. That really drove me, in the early stages, that's why I picked up the camera and started taking photos. At the beginning, it felt like a little bit of a chore, to be picking up the camera and taking photos, but when I started to see the response, and I started to see my own skills improving, my photography improving, it just became an absolute passion. I loved it. If I got the opportunity to go into space again I know the first thing I would do would be to go to the window, take out the camera and take a photo. "Hello, Is It Planet Earth?" was really wanting to immediately share those images of Earth and space. And that is something I could do really quickly. "Ask an Astronaut" has taken 6 months to write, and I've really put my heart and soul in it, and really try to go into much more detail about what living in space is like. What is it really like to be an astronaut on those long-duration missions, watching your body change, going through the training for the mission, coming back and the return to Earth, and answering all those amazing questions that people ask. Space.com: If you headed to space again, what would be your ideal mission? Peake: If I had my absolute wish of a second mission, it would be a mission that I think is probably coming up within the next 10 years, and that's the return to the lunar surface. NASA in conjunction with the European Space Agency and other partners are building the Deep Space Gateway, which is going to be a new space station in cislunar orbit, and that gives the opportunity to have missions back to the lunar surface, and also it's paving the way for the medium-term goal of getting to Mars. Space.com: What do you expect to see changing in spaceflight in the coming years? We're going to start to see that transition, that handover if you like, to commercial transport to low-Earth orbit. I think that will really energize a new, emerging market for microgravity research in low-Earth orbit. That's going to be fascinating to watch, as more and more of these companies realize the benefits of microgravity research. And at the same time, we're going to be watching the national space agencies partner on these exciting missions to the moon, and for preparations to going to Mars. And also space tourism — I know that Virgin Galactic, XCOR, Sierra Nevada, they will be working away on these space tourist missions, which are all going to start happening in the next five years or so. There's an awful lot that's going to be happening; it's going to be a very exciting time. Space.com: If you can comment, which commercial spacecraft would you most like to ride on? Peake: No, I'm not going to give you an answer on that one — but what I will say is that firstly, the Soyuz was just such an incredibly wonderful experience. It's steeped in so much history and tradition, and it's solid Russian engineering with this brilliant hybrid of old and new. It was an absolute pleasure to fly on the Soyuz spacecraft. From a test pilot perspective, and coming from a military test pilot background, the idea of flying on either Boeing or SpaceX's vehicle as a new spacecraft is very exciting … either Boeing or SpaceX would be a brilliant spacecraft to fly. Space.com: How does your test pilot background fit in with going to space? Peake: From a test pilot perspective, I felt that I did have a huge advantage, not just in areas with direct skill transfer like the robotic arm, which is very similar to flying a helicopter, [and] communications skills, for example, which we focus a lot on during test pilot training, but also the whole space station is a cutting-edge laboratory, and every day a lot of the pieces of equipment you're touching, a lot of the experiments you're touching, people are asking questions back on Earth. There're experiments that people are saying well, how is it going to work in microgravity. Just having that test pilot mindset of knowing how to conduct an evaluation, how to conduct an experiment and how to report the results clearly and concisely so that people understand how we can make things better … you're evaluating new pieces of equipment every single day. Space.com: I was struck by the huge amount of support you got on social media from people following your mission. Can you talk about that? Peake: It was a huge surprise to me as well. For astronauts on board the space station, it's wonderful to get that feedback, because it actually helps you connect back with Planet Earth. After a few months in space, you do miss your friends, you miss your family, you miss the company of other people. To actually be able to reach out to so many people on social media and share your mission, but also receive the warm feedback and the positive feedback that was coming was very important both ways — to share the mission with other people, but for me as well it was a source of connection with Planet Earth, which was wonderful. It's still quite surprising how isolated you are [in space]. On the space station we have limited email, we have very limited internet access, painfully slow; the only information we have sent up to us is that that's sent up by our ground control teams, our crew support teams. [For instance, a surprising social media moment was after] the spacewalk, although, for me, that was an absolute pivotal moment of my career, and a life-changing experience. I got back in after the spacewalk, and Tim Kopra and myself were just chatting and having a cup of tea and drying out the spacesuits and cleaning up. I went back into my crew quarter and it really hit me when I started seeing some emails, people telling me you've had an email from Elton John saying enjoy your stroll outside. I mean, wow! Okay. It really hit me that it wasn't just my own personal lifelong ambition come true, but it also had a huge impact on so many other people back on Earth. This interview was edited for length. You can buy "Ask an Astronaut" on Amazon.com.